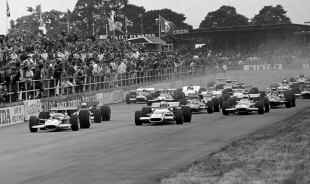 1969: The greatest British Grand Prix? Of all the combinations representing the 50th British Grand Prix at Silverstone, it's appropriate that Sir Jackie Stewart should be reunited with his Matra. Not only was the MS80 his favourite F1 car he will also be driving it at the scene of the best race I have ever had the privilege of watching. The 1969 British Grand Prix was a truly epic battle between Stewart and Jochen Rindt in the Lotus 49. For an hour and 18 minutes, the two fastest men of the era traded places continually as they left the competition, such as it was, miles behind. Stewart and Rindt may have been the best of friends but this was a intense fight, made all the more watchable by a mutual trust and respect that allowed wheel-to-wheel racing all the way round Silverstone, then in its traditional flat-out configuration. 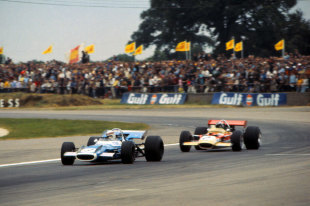 Rindt claimed pole after Stewart had shunted the Matra in the closing stage of qualifying. Totally committed though Woodcote - then, a long right-hander taken at 175mph - Stewart clipped the apex as usual but inadvertently dislodged a cracked piece of concrete, the jagged edge instantly puncturing the Matra's right-rear. The bright blue car shot straight across the track and into the earth bank, hitting it with enormous force. The chassis of the MS80, although badly damaged, had been strong enough to save Stewart from injury - as he proved by immediately leaping from the car to warn other drivers of the danger. In the lull that followed, he ran across the track to take over the car belonging to his team-mate Jean-Pierre Beltoise (as was allowed and, indeed, physically possible despite the seat and pedals not being perfectly positioned for Stewart). In the limited time remaining, Stewart somehow managed to put himself in the middle of the three-car front row. The moment the starter dropped the Union Flag, Rindt and Stewart were in a class of their own. At the end of the first lap, the pair were already more than three seconds ahead of Denny Hulme's McLaren. By the third lap, as Stewart latched onto Rindt's tail, the lap record had already been demolished. Stewart took the lead on lap six and the pair continued to outdo each other with a succession of fastest laps. Between laps eight and 15, Stewart recorded either a 1m 22.2s or a 1m 22.3s. Rindt covered his every move, a lap of 1m 22.1s taking him onto Stewart's gearbox as they came across Beltoise, struggling in the four-wheel drive Matra MS84 after giving up his preferred MS80 to Stewart for the race. As Stewart went to one side of Beltoise and Rindt the other, the Lotus came out in front. Rindt tried to make a break but the gap between them was never more than half a second as the pair drove on the absolute limit, the cars drifting mightily through Woodcote, Copse, Becketts and Stowe. This furious fight continued until half distance, the lead changing hands sometimes more than once a lap. As Rindt and Stewart hauled themselves onto a battle between five cars for fifth place, the leaders remained tied together as they sliced through the backmarkers, nether driver letting up for a second. Rindt tried once more to break free by extending his lead to three seconds. But Stewart was ready for a counter-attack. On lap 57, Stewart covered the 2.9 miles in 1m 21.3s, setting what would remain the fastest lap at an average of 129.61mph. Rindt's lead had ben reduced to just over a second. It was such a ferocious yet exceptionally clean contest that the first 78 minutes of the race seemed like seconds. The end to this utterly spellbinding contest came unexpectedly when Rindt rushed into the pits. The end plate of his rear wing had come loose and was fouling the left-rear Firestone each time Rindt flung the Lotus through a fast right-hander. The plate was wrenched off - so much for aerodynamics in 1969 - and Rindt rejoined 34 seconds behind Stewart and almost a minute ahead of Jacky Ickx's Brabham in third place. The sense of anti-climax was immense - even more so when Rindt made a second stop in order to top up with fuel. The results show that Stewart lapped the entire field. But the black and white statistics do not begin to create the hugely colourful picture painted by the blue car and the red, white and gold one on Saturday July 19, 1969. It was motor racing at its brilliant best. Even allowing for rose-tinted glasses, I've never seen anything like it since.